I should begin with a postscript to our previous dining experience. Last time we made mention of the Prosecco and that it wasn't to our liking. There was good reason for that as it turned out that a batch of the Prosecco was "off" so to speak. We tried it tonight and it was like night and day - this one was alive and fresh and we'd happily drink it in the future. So I think the lesson is that if you think something isn't right with a wine then you should say something about it. 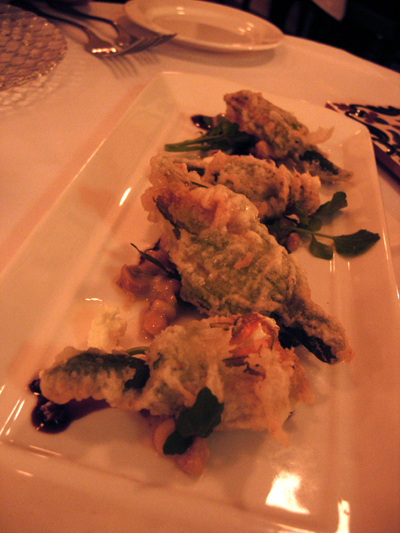 The batter was perfect - crisp but oh-so-light, the stuffing at the cusp between solid and liquid. It was good the stamens were removed, it's bothersome but well worth it. 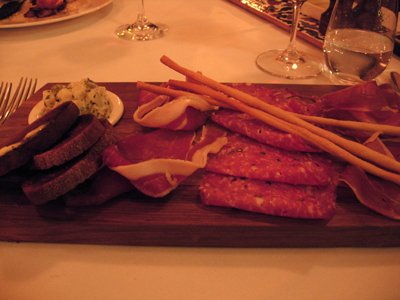 I chose the plate of Prosciutto and Salami - assorted prosciutto (local and Italian) served with salami made in-house along with grissini and slices of rye toast. To the side a small dish of truffled potato salad. 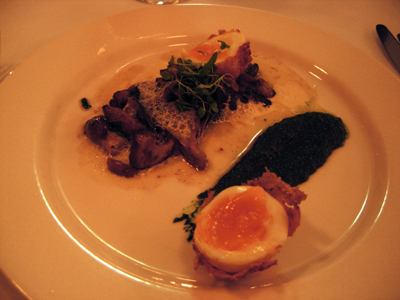 Paalo chose the Sauté of Autumn Mushrooms served with a crisp fried egg, parsley puree and parmesan cream. The egg was coated in grated parmesan and fried - I must try that at home! I have the Farmed Gippsland Rabbit which consists of discs of rabbit leg meat sausages and thick slices of the prosciutto covered loin. 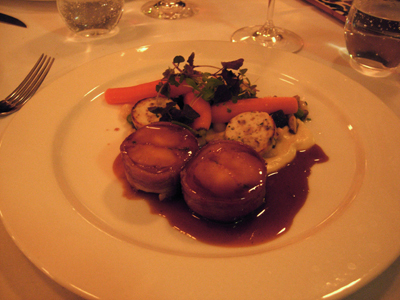 It is served with a cannellini bean puree and a rabbits favourite veg, carrot. The sauce served with this was utterly morish which is a common feature of all the sauces we've had here. 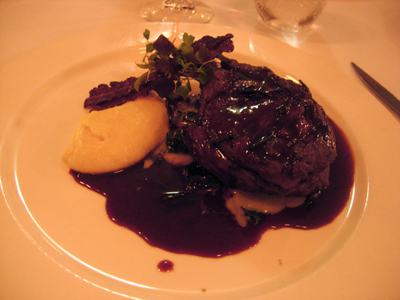 Paalo has the Green Mountain Veal Rib served with a velvety parsnip puree and sautéed cavolo nero. Horseradish, speck and truffle finish the dish. The torrone was very stick and soft with a heady flavour of honey - delicious. 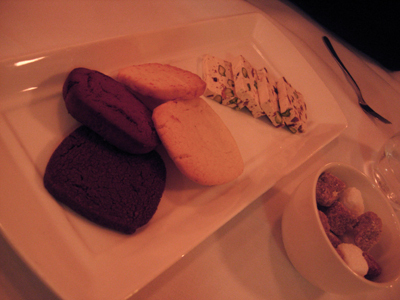 The assorted biscuits were equally satisfying. I really shouldn't scan your blog when I'm hungry - self inflicted agony. I've heard good things previously of the food at CSE, but hesitated going previously as the vibe seemed a bit cold (when I still thought it was part of the car dealership?). Might be time for a visit. Hi Kyla - it used to be owned by Duttons but that was ages ago and that relationship has ended. I think the space is large but charming and the collection of coffee makers is incredible. I certainly can't complain about the food and the service is pretty friendly so I think it is well worth a visit.